Laser Engraved Chrome Lighter with Tin Container. Lighters are made of brass. Refillable. Lighter Fluid not included. Lighter is held in the tin container with velvet coated plastic. 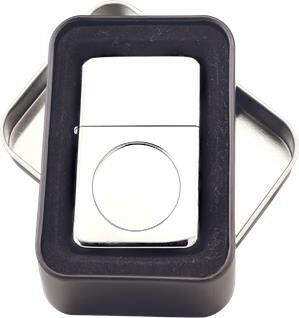 A 1" diameter recessed area is stamped into the lighter for an insert. Lighter engraves Black. Price includes engraving in one location. See options for cost of inserts and additional engraving.